Notes | This new release of LaBelle's old classic came out in the spring of 2005. Comments | [10/28/11] Dave Labelle is arguably one of the best teachers I have had at any subject at any level. His ability to instruct and analyze how to capture great pictures is rarely matched. 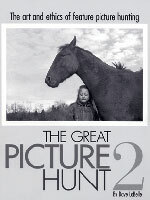 The Great Picture Hunt is a must have for anyone who wishes to work in American newspapers. Comments | [08/21/07] Getting and reading this book has been quite an experience! When I ordered it from Dave's site, he promptly e-mailed me and told me that he was in my area for the weekend, and that he would personally drop the book off at my place for me. He ended up not only giving me the book in person, he was generous enough with his time to meet me at Starbucks and cram my brain with excellet advice for half an hour. Thanks Dave! And yes, the book is as good as the rest of the reviews say it is. I can't think of any photographers I know who couldn't learn something from this book. Comments | [02/26/07] I have the first book and lend it to many who say "there's nothing to shoot." I loved taking LaBelle's class at Western and he always said don't be a baby bird and wait for hand-outs. Great book. Comments | [02/16/07] An excellent book made even better. If you've ever been told "go get a stand-alone feature shot for such-and-such page" you ought to read this book. Comments | [12/07/06] The Great Picture Hunt 2 is a great book for any photographer at any stage to read. After reading this book once, I had a better understanding of what photojournalism is all about. I know that when I read it again I will find tips that seemed to be hidden the first time through. My suggestion is to get this book and read it, cover to cover, then put it on your bookshelf for six months, then pull it out and re-read it. Comments | [11/11/06] An awesome book containing great tips on how to go about making feature photos. I'm glad this book focused on just the journalism part of being a photojournalist and leaving out the technical stuff. Dave has explained every aspect of getting a great feature photo -from the planning stages to getting the caption. Dave is a great guy and we're lucky to have him to show us this priceless information. Comments | [05/16/05] An outstanding read for anyone thinking of becoming or is already a photojournalist. Comments | [04/15/05] If you want to learn how to look for feature photos, you need this book. It gives great pointers from how to develop ideas to the ethics involved in photographing people in a positive light. This is a must have for all students and even for seasoned pros. You will gain new insights in shooting enterprise photos.